Update: Check out how my bedroom has evolved! View more recent posts here. 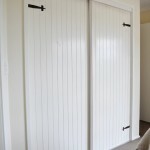 Some interesting wall angles and the need for tonnes of storage really dictated the design for our master bedroom. Function and budget were high priorities so I decided to work ‘pretty’ around ‘practical’. The neutral palette combines loads of natural texture with vintage elements for a relaxed yet fresh feel. While there are still a few additions I’m considering I’m pretty happy with how it’s coming along. I’m also waiting to put some finishing touches on the built-in robe doors and will share the after pics of them soon too. Well, that was after we already simplified the canvas by painting out the green walls and brown trim (Dulux Chalk USA on the walls, Dulux White Watsonia on the trim), replacing the dirty old carpet and removing the completely translucent ultramarine blue curtains! If you’ve been following this makeover from the beginning, aside from being incredibly patient), you should also recognise a fair bit of the decor. Pretty much all of the furnishings have been thrifted, bought on clearance or hand-made and every piece of furniture in the room is second-hand. To avoid a massively lengthy post I’ll cover each refurb in more detail in separate upcoming posts. Your bed looks fabulous. And I love the finishes you painted on your furniture, especially the black/grey armoire. I’d love to see how you did them all. looks amazing! I love how they are all so different, and yet they still work so well together! Just fabulous and worth the wait – for us and you! Hi kristine, Your bedroom is beautiful! I love the framed maps and the color you painted the armoire. Everything is stunning. You have done an amazing job! It looks fabulous and the gilt-framed map is stunning. The room has been transformed! Oh, I’ll definitely be looking for more info! Your room is just beautiful! I loving the transformation of each piece you showed. You have such a sense of what works for a neutral color scheme. So calm and relaxing but great intrest as well. Thanks so much for showing us this stunning room! What a beautiful room you have created! So calm and relaxing and full of original pieces! Your artwork is really beautiful!!! I can’t wait to see how everything breaks down! You are not only a woman of great style but a true designer in every sense of the word. I totally admire your creativity and cleverness. i especially love the pieces that you took from a warm maple stain to a darker walnut type stain- they look fabulous! 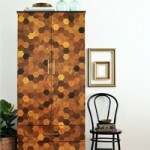 and the armoire is gorgeous as well- it all works beautifully together. you must be able to relax so much easier now in your bedroom! That is a pretty impressive transformation! I love that you repurposed each piece and gave it a new life and fit your personality into it! The map is by far my favorite. You have a gorgeous space! What a beautiful bedroom! Love the headboard picture. You did a great job with all the fabrics and finishes. Thanks for sharing!! I need to get busy in my bedroom! Very very pretty!!! I love all the soft colors. Wow, wow, wow. This room oozes warmth and relaxation. Love the wide variety of textures you’ve incorporated. And I totally want to steal the framed Paris map above the bed! Beautiful!! I can’t wait to get started on our bedroom. Will you be sharing some info on the paint technique you used on the armoire? Your room is so beautiful and s comfy cozy! My heart is going pitter patter. What a fabulous transformation. Love all the colors and furniture choices. The blue on the armoire/wardrobe…is my favorite. Just beautiful! Wow! What a transformation! This is really really beautiful! Thank you so much for sharing, I’ve really been inspired! Oh my Lord, Kristine, you’ve outdone yourself. I cannot get over the before and after furniture pieces. The map above your bed is brilliant. The accessories are perfection. I cannot wait to see individual posts on your furniture rehabs. You are truly one of the most talented designers out there, and I truly mean that. Serenely beautiful. I would never leave my bedroom if it looked like that. I am madly in love with your bedroom!!! It has a very country European look. I love it!! I will definetley be looking out for the tutorial on the blue closet…GORGEOUS!!!!!! Your bedroom is really beautiful. I especially like your headboard! What a stunning bedroom!!! 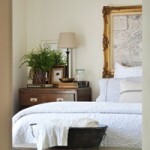 Just beautiful…I love the Paris map in the beautiful frame above the bed! Your bedroom is gorgeous! What a beautiful job you’ve done on everything! My eyes are amazed at what you did to the painting hanging above your bed! Those other colored maps framed – that’s a great idea! Love it all and I know you’re so proud. Amazingly gorgeous. UGHHH! I love all the details. From the hardware on the armoire to the amazing maps. So beautifully done. Congrats. Your bedroom looks so peaceful. How wonderful to be surrounded by simplicity but yet beautiful last thing at night and first thing in the morning. Love what you’ve done with the furniture! The room looks gorgeous! I love it all! The transformations are amazing. 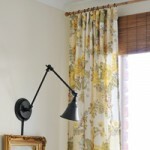 Thanks for sharing as I don’t like my bedroom and am really inspired to tackle it all.. one item at a time. Kristine- it’s beautiful!!!! you’re so talented and i love it!! Kristine you did such a fabulous job on your revamping of this room. I am so proud to of been a part of following your vision, this is exciting to see it all done! So pleasing to the eye, I just love the flow of how you brought all the different style and finishes together. Fantastic! Kristine, your room is fabulous and what wonderful before and afters of the furniture pieces. I love the color of the armoire. 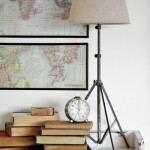 Great idea using a framed map as a headboard. I hope you link up to my before and after party that runs on Wednesdays with the link up Tuesday night. Thanks for showing each individual before and after, really beautiful! Very inspiring, making me want to head out and paint something! WOW! That is pretty amazing, so beautifully done! Looking forward to the breakdown of each project. Congrats!! I love it! You did such a great job! I’m totally in love with all of the furniture makeovers especially! It looks like a great place to go and relax! Really great job! Great job! It looks so comfortable, calm and beautiful. definitely worth the wait. Love how you outfitted the bed. Loving the afters of all the furniture pieces you worked on as well. You did a great job. It looks like its right out of the pages of a magazine. I love your paint techniques. It seems these days everything is painted either solid white or black. This is unique and beautiful.